Lay Off My Wife? -- He Can't Be Serious?! Is this another blatant example of Obama's political naivete, his inability to take criticism while dishing it out, or a calculating move that panders to the female voting population? Or is it truly chivalry, a simple case of a man attempting to protect his wife from unpleasantness? That's certainly what they want it to look like, and in his charismatic way, Barack Obama almost pulls it off. But we've seen him get a free ride and the blind eye of the media a few times too many. The man is becoming afflicted with Hillary Clinton's disease - he just can't seem to tell the truth. Which makes his every word and action suspect, just like Clinton's. Perhaps he's forgotten the criticism leveled for years at Hillary Clinton as her husband ran for political office. Or the attacks the Dems leveled at Nancy Reagan for consulting her astrologer. There have been few attacks against Laura Bush, and that's likely because she doesn't put herself out there in the public eye, speaking for her husband. She tries to remain as private a person as is possible in such a public position. Some may think that perhaps under Michelle's bravado, she got her feelings hurt because someone in the country she's "finally proud of for the first time in [her] adult life" had the audacity to return fire. But I doubt it. This woman is a lawyer. She's trained for adversarial roles and having people attack what she says. And as the Skippy peanut butter commercials used to say, "You [she] asked for it!" Or perhaps Obama was slyly pandering to female voters in an attempt to steal some votes from Hillary Clinton, as hero Barry rides up on his stallion as the great protector of his poor, defenseless "little woman." Just add women to the list of the "vicitimized" in our society to whom he is appealing. Michelle Malkin points out Obama's list of "mistakes," including his comment that so far he'd been to 57 states, and had 1 to go. Sounds like that elite education was short on American history and civics, and American geography, too. Or perhaps, as Bill said of Hillary, Obama's just tired because of the rigors of campaigning, and we should give him (and his wife) a break. The media certainly seems to be doing just that. In one sense, Obama's charisma has made him the Obi-Wan Kenobi of this campaign. He simply smiles, waves his hand at the media, and tells them, in essence, "You don't need to see my ID." And just like the storm troopers, they look at each other and nod, "We don't need to see his ID," as he slips right past them. He's articulate, well-spoken, appears calm and reasonable, and it would be easy to get caught up in his charismatic speeches. But ignore the charisma, and listen to what he says. In his own words, "Words matter." And his wife's words matter almost as much as his. Certainly, a spouse's comments on the campaign trail represent (or at least reflect on) the candidate, and they deserve the same scrutiny as his/her own. I seem to recall the Obama camp leveling a few attacks on former President Bill Clinton's remarks as he stumped for his wife. But Mrs. Obama is off limits? Not. Members of a candidate's campaign are under intense scrutiny, and rightly so. Geraldine Ferraro was forced to resign from the Clinton campaign, in order to minimize the damage to Hillary, for a rather pragmatic comment the Obama camp cast as racist, but his wife can insult the whole nation and he expects no criticism of her? He doesn't think she's fair game when she speaks out publicly as part of his campaign? Puh-lease! His minister, his "spiritual mentor," the man who married him and baptized his children, can grandstand all over the country, to anyone who will listen, with his fire-breathing hatred for this country, and Obama doesn't think it's fair to question whether he share Wright's views, since he's been listening to them for 20-plus years? A true American would have gotten up and walked out, more than once, during those sermons whose snippets are now famous! Oh, that's right, Obama says he wasn't there any of those particular Sundays. So how is it that Wright managed to reserve his fiery condemnation of this country that gave him so many opportunities for the days when Obama wasn't in the congregation? Coincidence? Or does it require "the willing suspension of disbelief" to accept Obama's assertion that he hadn't heard Wright make such comments? Did the Obamas really think Michelle could go out there and insult the entire country, more than once, and have no one take her to task? Please - don't further insult our intelligence. Both of them are Harvard-educated lawyers, and smart enough to know better. It seems Barack Obama is successfully picking up Bill Clinton's "teflon man" attributes. Like Bill, he seems to think he and those who are part of his campaign, are immune from criticism, or above reproach, and can do or say whatever they want without consequences. And that seems to be the case thus far. But the hypocrisy and racism displayed by the Obamas is beginning to grate on people already, and the REAL fight hasn't yet begun. Obama casts himself as the representative of the "poor, victimized" black population of America. The truth is, Barack Obama grew up in a white home, and until he went to college (at the elite Columbia University in New York), he never lived in mainland America! Barack Obama grew up in Hawaii and Indonesia. His black father abandoned him and his mother before he was a year old. For the four years Obama lived in Indonesia with his mother and her second husband, from ages 6 to 10, he had the opportunity to see how poor Indonesians live. But for the rest of his young life, until he went to college, Barack Obama lived in a white home. At age 10, Obama's mother returned him to Hawaii to afford him a better education than he could receive in Indonesia. His grandmother was one of the first female vice presidents of the Bank of Hawaii, and she arranged for him to attend, from the age of 10, an elite Hawaiian prep school where his classmates were the children of the wealthiest families in Hawaii. Those who worked at the bank with Obama's "Tutu" (grandparent in Hawaiian) remember Barry and his sister coming to the bank after school, where they did their homework while they waited for their grandmother to finish her work for the day. Does that sound like the life of the typical "poor black man" in America? Contrary to Jeremiah Wright's now-famous fiery assertion, Barack does NOT know what it's like to grow up a poor black man. Barack claims the south side of Chicago as home. But that's Michelle's home, which he adopted when they were married. He moved there after graduation from law school, at age 24. That may have been his first opportunity to see how "poor black men" live. Sadly, black voters in this country are having the wool pulled over their eyes. The widely-touted first African-American to run for President of the United States appears to have nothing in common with the majority of blacks in this country, save for half African ancestry. Yet it appears he is likely, at this point, to parlay that into the Democratic nomination for President. Few voters will care enough to educate themselves about this man's background. Like the women who will blindly vote for Hillary solely because she's female, many of them will blindly vote for Obama based solely on the color of his skin, mistakenly believing they're voting for one of their own, who understands their struggles because he's been there. Obama certainly had struggles in his life, as any child of a single mom does, and more than most because of his parents' interracial marriage at a time when that was illegal in more than half the states, and being moved to Indonesia at age six. But Obama's were not the same struggles as the "poor black men" growing up in mainland America. How many "poor black men" from the south side of Chicago, or Detroit, or Mississippi or Alabama, go to elite prep schools attended by the children of the wealthiest families in the community, followed by college at prestigious universities like Columbia and Harvard Law? Or live in two-million-dollar homes? Don't be misled into believing that Barack Obama is the "typical American black man." For starters, he's only half black, and he grew up in a white family. 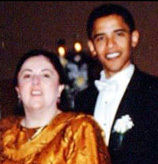 One other thing that should be noted by those who are critical of Michelle Obama (and there are many): Barack Obama was raised mostly by his single mother and by his grandmother. He is conditioned to having his life directed by women. It's hard to imagine his marriage is any different. After all, he met Michelle when he was a first-year law student and she was his supervising attorney for a summer internship at the Chicago law firm of Sidley & Austin. From the beginning of the relationship, she has given him direction. And that's not likely to change. So before you vote for Barack Obama, you'd be well advised to also investigate Michelle Obama and her opinions. She's the one who will be whispering in his ear the most. In addition to her work at the law firm of Sidley & Austin, a large and prestigious law firm, she has worked on the staff of Chicago Mayor Richard M. Daley, and for the University of Chicago and the University of Chicago Hospitals, where she worked on diversity programs. Sound off! Tells us what you think about the media scrutiny of Michelle Obama, and her husband's response. Join our election debate.